Everest Poker came into the online poker market in the attempts to be a multilingual, multinational poker room. Everest Poker has done a great job of doing that, with software operating in a choice of 16 different languages. The site has actually profited from the fact that U.S. Players are banned from the site since it is mainly aimed towards a European market. Everest offers decent tournaments and is home to many European players, but is lagging when it comes to their cash game options. 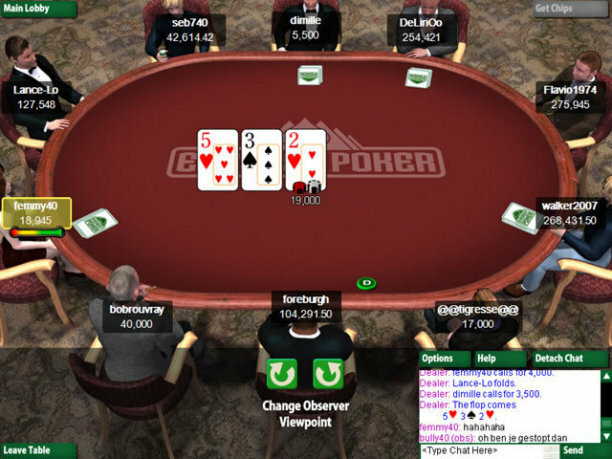 Everest Poker is known for hosting many satellites into live events. Freerolls and point tournaments are abundant. Everest also occasionally offers a reload bonus and they also have a reload bonus. They also have a promotion where they match what WSOP qualifiers earn in the WSOP up to $1 Million. Everest Poker actually offers the players a choice of 2 different bonuses when depositing for the first time. There is the $300 incremental bonus, where a player receives $.06 for every point he earns. Then there is the $500 lump sum bonus, where the player receives $500 at once when he earns 6000 points. 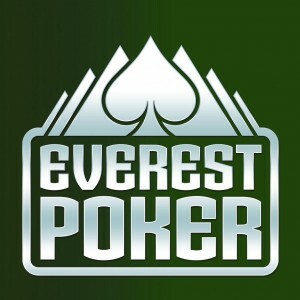 The Everest Poker Bonus is one of the best bonuses available of any online poker room. Rakeback is much different on Everest Poker. Players cannot receive rackback through 3rd parties. Instead, players must be a part of Everest’s VIP program. Players can also receive rakeback by choosing stackable bonuses. Both options give players the chance to earn up to 50% rakeback, which is unpresendented in the online poker world. Everest Poker’s tournament schedule is considered to be decent. The biggest daily tournament is a $5,000 guarantee and the weekly $30,000 and the weekly $100,000 guarantee which bodes a $215 buy-in. There are also many tournaments that run as low as $1 and there are many freerolls. Tournament competition is widely considered to be loose and poor. Everest Poker has very decent, middle-of-the-road gaming statistics. During peak hours, there are about 7,000 ring-game players and about 16,000 tournament players. Everest only offers Hold Em and Omaha, so once Everest adds new games such as 7-card Stud and Razz, traffic is expected to increase. These stats are from September of 2009. Everest Poker is considered to have very high quality software that runs smoothly and quickly. Everest Poker has very high-quality customer support. Although support is only offered via email, the support is quick, they answer the player questions accurately and support is offered in 16 different languages. This entry was posted on Wednesday, September 16th, 2009 at 2:19 pm and is filed under Poker News. You can follow any responses to this entry through the RSS 2.0 feed. You can leave a response, or trackback from your own site.